Written in free verse, we meet Blade, who is almost 18, and the son of a famous rock star. His father is now more famous for his crazy acts while drunk or on drugs. His older sister is still supportive of their father, but not Blade, not anymore. On the day of his high school graduation, when he was ready to address the students and parents, his father created a spectacle by running a motorcycle into the stand. That evening his sister reveals that Blade was adopted. And in no time he is on his way to Ghana, to find his birth mother. She is from the U.S. but is working in Ghana, to make a difference. 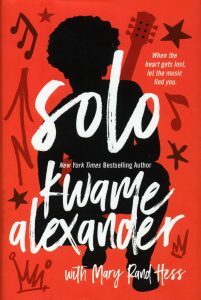 Blade has much to sort through— the death of his adoptive mother when he was about 10, his father’s behaviors, his girlfriend cheating on him, meeting his birth mother, the people he has met in Ghana, and his nightmares that won’t let go. A look at the cathartic moments in the main character’s life, and what it reveals of his true self. Amazing. Alexander is one of my favorite authors, and this title is one more of his I greatly enjoyed.